This reminds me of our family trip to Yellowstone. After an all-day drive to the park, I was tired, hungry, and JUST WANTED TO GET THERE. We stopped behind some cars that had stopped because there was a bear on the side of the road, but I insisted DH pull around the jam and continue driving. We never saw another bear or sign of bear the rest of the visit. Such lovely photos you take... and this is definitely another great capture. Of course it would wait until it was too late and make its showing just for you. Because we all know how you just can't get enough moose. 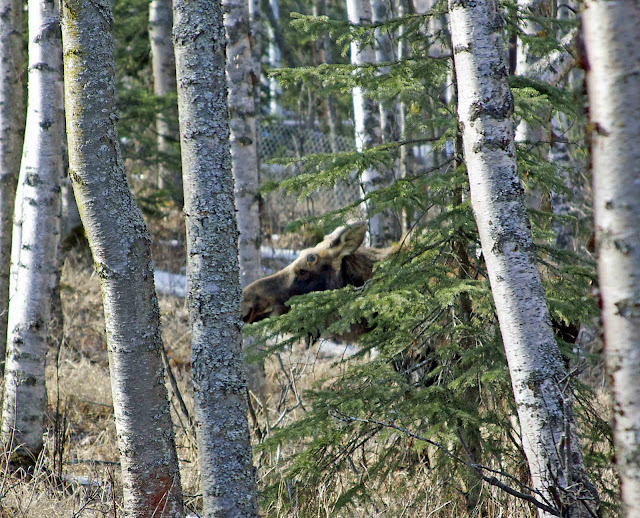 I do love a good Moose picture. The most exotic thing I can offer to photograph here in Virginia is a wild turkey! And not the liquor kind ;-)They are very hard to catch on camera. Oh, my gosh...I would have loved that! I am a huge lover of nature and animals! What great shots! That would definitely be my luck too. 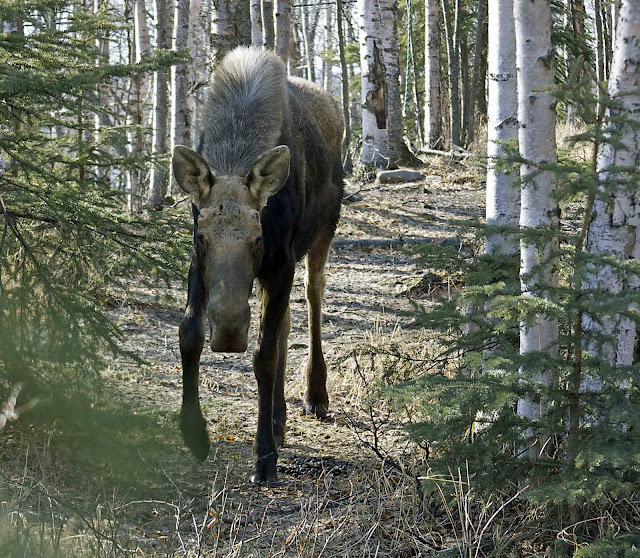 I was just thinking yesterday that you hadn't posted any moose pictures in a long time and feeling a tad bit moose-deprived . . . thanks for making my day! How funny that the moose didn't show up until after your sister left. Isn't that always the way! Holy crap!!!!! He got pretty close to you, didn't he??? And it figures that he'd wait to come out from the woods until she was gone, huh? 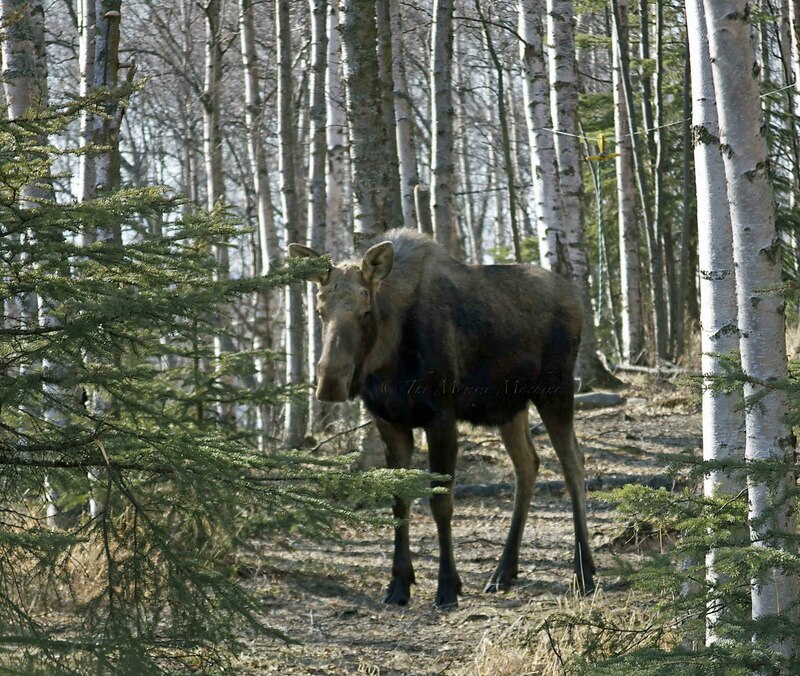 My friend who used to live in Anchorage was chased by a moose once. The way she recollects it is so funny.